‘Gog and Magog’, enemies (a large number are) of God’s people who are supposed to come at the end of times and lead God’s people into destruction are first mentioned in the book of Ezekiel. 241 Ezekiel, who is an Old Testament prophet is also known as ‘Dhul-Kifl’ in Islam. Televangelists are misinterpreting the prophecies stating Gog and Magog will soon come, but they are already here and have been here for centuries. The majority of today’s Jews are not descendants of the twelve tribes of Israel (Jacob), they are merely converts. Over the centuries they have multiplied, they have spread out across the many nations and have interbred with most nations. God is saying He is against them but He will bring out with all their great numbers, and full armour and artillery. The land is Palestine and the original Israelites who lived in Palestine had been dispersed (living in exile) after several invasions (Assyrian, Babylonians etc.) They came back and lived safely, these Israelites (known as Palestinians) either remained Jewish, or had converted to Christianity or Islam. They were of that land Palestine and were still the seed of Abraham. 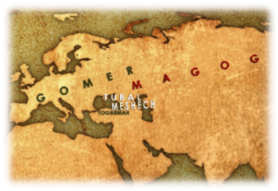 After World War II the leaders of the world (who are most probably descendants of Gog and Magog but pose as Christians) mustered and sent the European Jews (descendants of the Khazars i.e. Gog and Magog) to Palestine. The main invasion started.